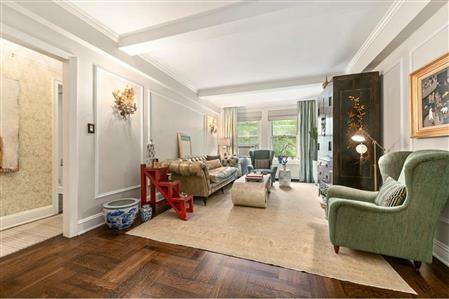 Emory Roth, Pre-War Grandeur meets 2018 at the Premier Coop- 60 Gramercy Park North!! Enter this Move-In Ready, Stunning 2 Bedroom, 1.5 Bath, home through the L Shaped Foyer and enter the Spacious Living Room boasting, Beautiful Sunlight, Beamed Ceilings and Hardwood Floors. Through the Classic French Doors is the Dramatic Formal Dining Room that leads to the Granite, Windowed Kitchen with a Miele Dishwasher and Unique Stained Glass Sliding Door. Both, Gracious Sized Bedrooms have California Closets and are Pin Drop Quiet. Looking out the windows to the North from the Living Room and Master Bedroom, you can almost touch the Treetops, playing in to the Peacefulness of the apartment. Rainfall Shower Head in the Windowed Bathroom, separate Powder Room as well as Mouldings and Ceiling Pendants throughout the apartment, for Pre-War charm, are just the finishing touches to this Glorious Gramercy Park Home. With a Coveted Key to the Park, this Pet Friendly Building has Full Time Doorman, Live-In Super, State of the Art Fitness Room, Courtyard/Garden, Extra Storage, Laundry Room and is Steps to some of NYC's Best Dining, Shopping and Transportation.